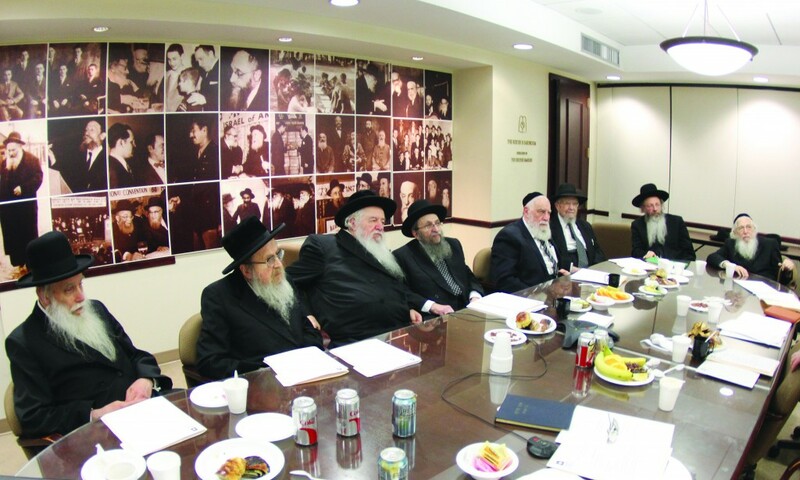 L-R: Harav Aharon Feldman, Rosh Yeshivah, Yeshivas Ner Yisroel; Harav Simcha Bunim Ehrenfeld, Mattersdorfer Rav; Harav Yaakov Perlow, Novominsker Rebbe and Rosh Agudas Yisrael; Harav Shmuel Kamenetsky, Rosh Yeshivah, Yeshivah of Philadelphia; Harav Yosef Harari-Raful, Rosh Yeshivah, Yeshivat Ateret Torah; Harav Dovid Feinstein, Rosh Yeshivah, Mesivta Tiferes Yerushalayim; Harav Aryeh Malkiel Kotler, Rosh Yeshivah, Bais Medrash Govoha; and Harav Aharon Schechter, Rosh Yeshivah, Yeshivas Rabbeinu Chaim Berlin. Not shown, Harav Avrohom Chaim Levin, Rosh Yeshivah, Yeshivas Telshe-Chicago, who participated by phone. Among the topics discussed were the threatened drafting of yeshivah bachurim in Eretz Yisrael, and the ongoing legal action concerning the regulation of bris milah. This article appeared in print on page 1 of the February 21st, 2013 edition of Hamodia.